Are you looking for any ideas to spend an unforgettable Easter in Florence? How about waking up in your room in the wonderful historical center of Florence? Our holiday apartments are the ideal choice, furnished with taste and elegance, in a classic style but equipped with all the modern comforts, from the microwave to the internet connection Wi-Fi. The choice is between three apartments on the first floor of two historic buildings. You will be within walking distance from the main monuments of the city: the Uffizi Gallery (just around the corner), Ponte Vecchio and its famous shops of goldsmiths, the Cathedral (also known as the Basilica of Santa Maria del Fiore). We suggest you to climb the 463 steps of the Brunelleschi’s Dome to enjoy a breathtaking view of the city and bring home the best pictures. 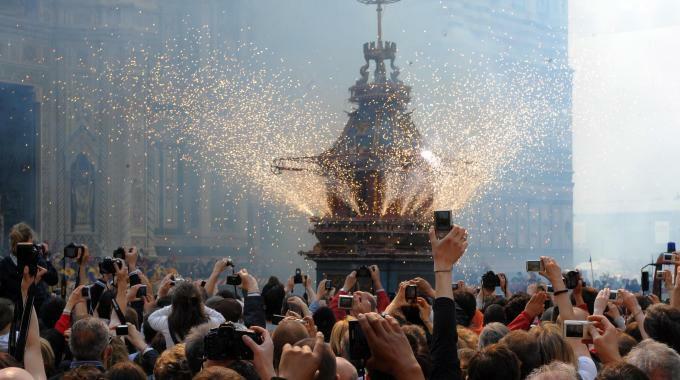 In the cathedral square, on the Easter morning, do not miss the famous Explosion of the Cart, which is an important moment of the Easter Florentine tradition with typical fireworks. And then a trip to the Pitti Palace, a walk to the Boboli Gardens or along Piazzale Michelangelo. Dedicate some moments of your holiday to the art and the visit of the most beautiful museums in the city and go to the discovery of the traditional dishes: from the T-bone steak Florentine style to the crostini with chicken livers, from the Florentine crushed to the Lenten biscuits. Your holiday can be booked directly online from this website at the section Book now. You will buy at the best price guaranteed online and will have free internet Wi-Fi included in the price. What are you waiting for? Enjoy your Easter in Florence! For information and reservations please contact us at info@appartamentilussofirenze.it, by phone at +39.055.2737603 or fill in the following fields. We will answer as soon as possible.